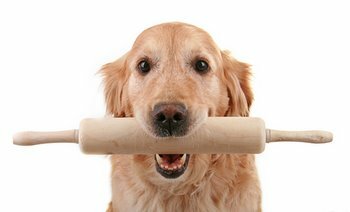 Animal lovers and pet insurance enthusiasts everywhere will be excited to learn that today is National Dog Biscuit Day! And while it might be easy to swing by the store on your way home from work, why not bake some dog biscuits in your own kitchen? It’s easier than you might think! Even if you don’t consider yourself a baker, don’t worry. The best recipes only require a few easy-to-find ingredients, which won’t take a toll on pet health if given in moderation. They’re also much easier to make than people treats. And of course, we pretty much guarantee your dog will scarf them right up. Directions: Preheat the oven to 350 F. Combine oil, peanut butter and water. Add flour gradually until dough is formed. Knead it and roll it out to about 1/4″ inch thick. Cut into shapes with a bone-shaped cookie cutter and bake on an ungreased cookie sheet for about 18 minutes. Keep a close eye on them because they’ll burn fast once they’re done baking! Directions: Preheat oven to 350 F and lightly grease a cookie sheet. Combine parsley, carrots, cheese and oil. Mix dry ingredients separately and add to the veggie/cheese mix. Add water little by little until dough forms. Knead for one minute, then roll out to 1/2″ thick. Cut into pieces with a cookie cutter. Bake for about 20 minutes until they’ve browned. They might feel soft at first, but will harden as they cool. No cookie cutter? Use the top of a glass to cut out perfect circles, or a knife to cut squares. Share the love: Double the recipe, allow the biscuits to cool and then package them up for your pup’s friends. Goodie bags and pawprint ribbon can be found at most arts-and-crafts or dollar stores. Everything in moderation: Remember to calculate your dog’s treat intake at meal time. If it’s been a special day with lots of extra treats, you may want to cut back a bit on dinner for optimal pet health. If you must go the store-bought route, seek out high-quality products with short ingredients lists. And be sure they were made in the United States – imported treats have been recalled after compromising pet health. For more information about pet health or to learn more about pet health insurance visit Pets Best Insurance. Pets Best Insurance assumes no obligation or liability, and makes no warranties, with respect to these recipes.